A brief little history of one of our favorite styles of beer - the IPA. What makes an IPA an IPA? Grab a Rivertowne and learn something new! Aaron Zak, a brewer at Rivertowne's Export location, grew up in Mercer county then went on to graduated from IUP. He then lived in Cleveland and moved to Pittsburgh 8 years ago. 1. What inspired you to become a brewer? When I was in school at IUP, they offered a class in micro-brewing/brewpub management. The first day of class we went through a 200 slide PowerPoint about brewing process and styles. After class, I went to the local six pack shop and picked up a mix and match pack of bottles. Up until this point the only beers that I have ever had were domestics like Keystone light or Milwaukee’s best. After the first sip of craft beer, I was hooked. It wasn’t long after that I realized that I could make a living brewing beer. 2. Did you come up with a recipe for any beers? I have come up with a number of recipes during my brewing career. I have brewed beers ranging in style from German lagers and Weiss beers to IPA’s, Stouts, Saisons, etc… Working at Rivertowne we are very lucky to have the number of brewers that we have with all their experience and diversity. Sometimes when writing a recipe, you start out thinking you’re going to make a beer a certain way and then after a couple of beers and talking to the other brewers you come up with a recipe which is really a collaboration of everyone’s strengths. 3. What draws you to certain styles, as a drinker and brewer? What do you find appealing? I am attracted to all styles of beer. There are very few beers that I won’t drink. As a brewer making beers for sale to the public, you sometimes need to remind yourself what the current market is asking for. I really like kettle soured beers like a Berliner Weiss. However, you see most of the market steer more in the direction of IPA’s, which I enjoy too! But whether I am the drinker or brewer, I am always looking to try new and different beers. 4. 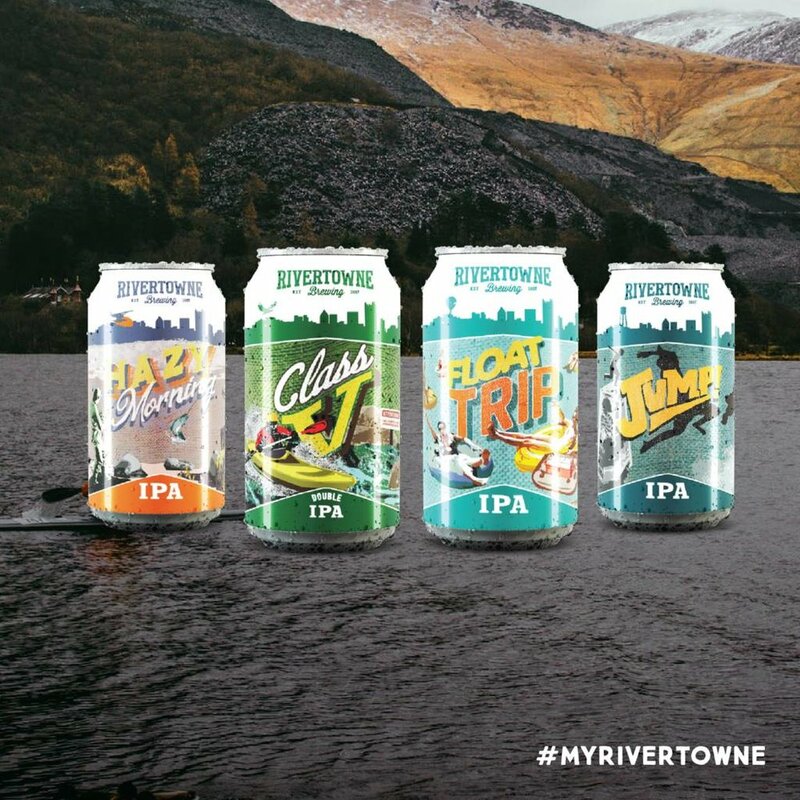 What is your favorite Rivertowne brew? 5. What’s your favorite aspect of it? It’s a very juicy and drinkable IPA. 6. Describe it in 10 words or less. 7. What is a good food pairing with this beer? 8. Do you know a story - or have a personal story - that revolves around a Rivertowne beer? It’s kind of brewers code that whenever an important moment happens in your life (having a kid, getting married, etc..) you brew a beer to commemorate it. A few years back when I was newer to the Rivertowne team, I got married a had the opportunity to brew a beer for the wedding reception. It’s just a cool memory looking back at our wedding reception and being able to share this special beer with all of my friends, family, and coworkers. P.S. the beer was better than the cake. 9. What is your favorite outdoor activity to do while enjoying Rivertowne beer? One of my favorite things to do when I am not working is to barbecue. I don’t mean grilling steaks but roasting meat on the spit or smoking a brisket for hours. Something about hanging out with some friends, smoking some meat and enjoying some beers. 10. What is one quote or lyric that gets you through the day? 11. If you were a beer, what style brew would you be and what would you call yourself? Crème Burly by Southern Tier because I’m big and sweet! Get inside the mind of a brewing legend. We sat down with Rivertowne's Lead Brewer Dale Walters and asked him about his passion for craft beer and brewing. Local Pittsburgh brewery Rivertowne Brewing and Wilderness Voyageurs are giving a free weekend for two in Ohiopyle. Share your summer lifestyle using #MyRivertowne and #RivertowneSummer for your chance to win.